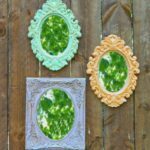 Ahoy, DIYers! Get on board with the hottest accessory trend of the summer: nautical jewelry! This season, we’re taking our style inspiration from the sailors. 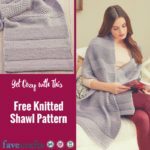 Rope, red and blue color schemes, and nautical knots have been flooding the fashion scene, and we want to dip into this cool new trend the DIY way. These nautical necklace patterns we’ve pulled together will have you looking like the most stylish sea-faring fashionista this side of the Pacific. Nothing gives off that nautical vibe better than finger knitting. 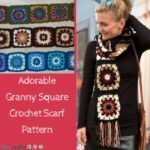 This Chunky Finger Knit Necklace pattern will have the most skilled sailors in awe of your knotting expertise. Pair this piece with a striped tee for the full oceanic effect. Go aquatic the Anthro way with this Set Ashore Necklace. 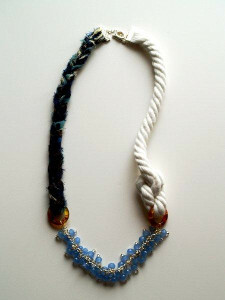 This DIY necklace project incorporates rope, beads, and fabric for a marine-esque mixed media effect. Don’t dry up your bank account buying the store-bought version; save some coin with this nautical-inspired necklace pattern. 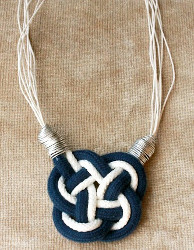 Natalie from Creme de la Craft has put her own twist on the nautical necklace trend with this knotted knock-out. Dress up your nautical look for night by adding some glamorous gold chain to the mix. 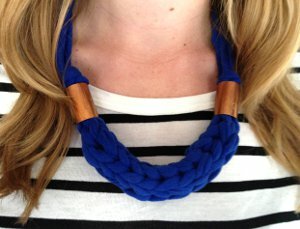 This DIY Nautical Rope Necklace is so easy to replicate, it’s sure to be smooth sailing even for beginners. 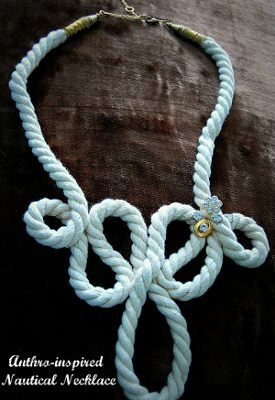 Don’t get your knickers in a knot; this Nautical Knot Necklace pattern is easier than it looks. Would you ever guess this chic pendant project is made from shoelaces? It’s true! Make a splash at all your summer soirees with this totally twisted piece. Jen from Tatertots and Jello has nailed that nautical vibe with this Anthro-inspired piece. Try this tutorial for a more organic oceanic effect. 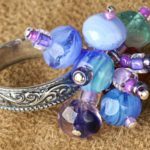 The curls and coils of this Anthro-Inspired Nautical Necklace, as well as the rhinestone embellishments, add a bit of femininity to this sea-faring fashion statement. What do you say, are you on board with the nautical necklace trend? 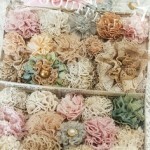 Wow some amazing necklace designs here and all very nautical, love the shape of the last on with the cream knot. 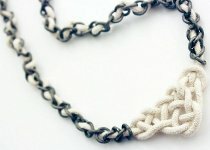 Would like free nautical necklace patterns. They are beautiful. 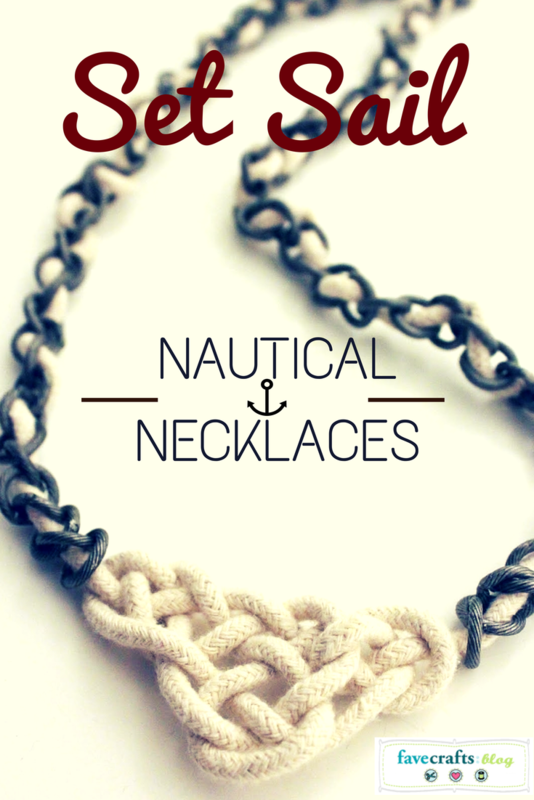 I would love to learn to make the nautical necklaces. I have never braided anything in my life. 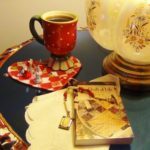 But my husband of thirty years has had near death health issues . And I think he and I would enjoy making these for Christmas gifts! 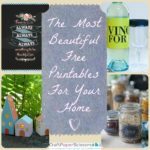 Plus this will change our thoughts of worry to thoughts of being creative! Please post the instructions so we can give it a try. Our funds are very low due to health issues but if they are free and on line I would love to try to learn to braid.